Nachum Gutierrez grew up in Colorado Springs. After finishing a BA in History and Religious Studies from Metropolitan State University of Denver, he traveled together with his wife Melissa to Israel where he studied for two years at The Pardes Institute of Jewish Studies. After Pardes, Nachum began his studies for semikha at YCT. While at YCT, he completed a unit of clinical pastoral education (chaplaincy) at the Hebrew Home at Riverdale/JTS and has had a two year rabbinic internship at The Abraham Joshua Heschel School. 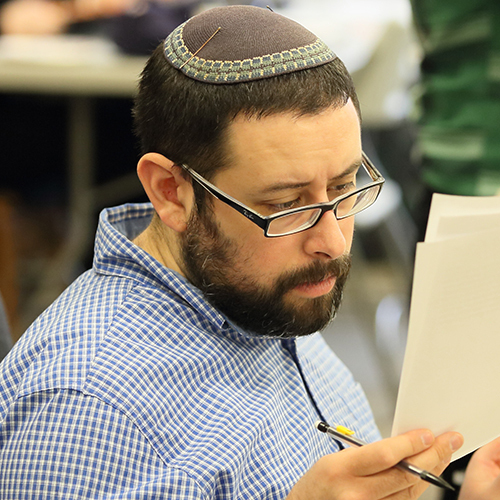 Nachum aspires to be a Jewish educator who can inspire his students to truly and deeply engage with Torah and to be awed by its beauty and profundity. He, along with his wife Melissa, his son Izzy and his daughter Evvy are very excited to be moving to Atlanta, Georgia where he will be serving as an educator on the middle school Judaic Studies Faculty of The Atlanta Jewish Academy.